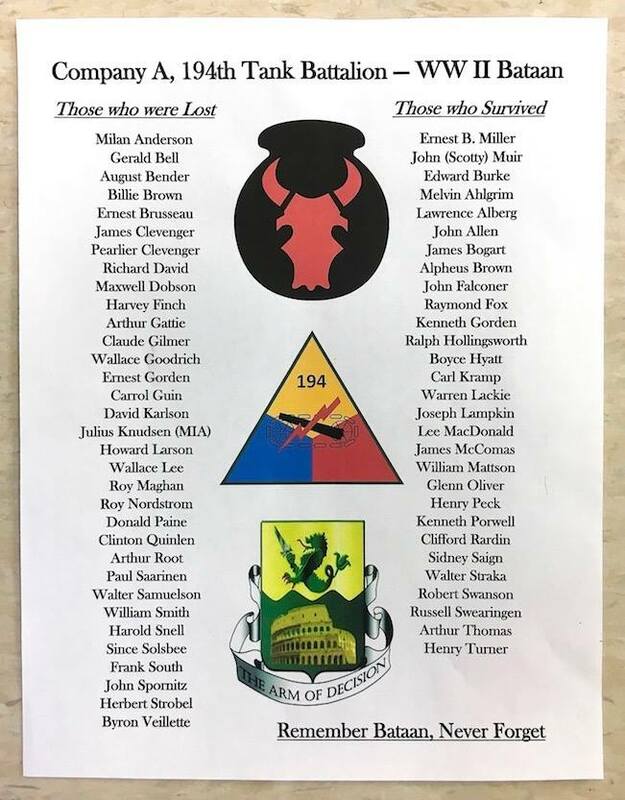 THE PUBLIC IS INVITED TO ATTEND THE ANNUAL BATAAN MEMORIAL SERVICE on Tuesday, April 9, 2019, in Bataan Memorial Hall, Minnesota National Guard Armory, 1115 Wright Street, Brainerd, Minnesota, to recognize, honor and remember the men of Company A. Joining the public in this moving ceremony will be Walter Straka, the sole Bataan survivor of Company A, members of the 194th Tank Regiment, soldiers of the 1st Battalion, 194th Armor, and descendants of the men of Company A. Following the memorial ceremony, refreshments will be offered to those who wish to remain in Bataan Memorial Hall to reminisce and to contribute to the community of the Battling Bastards of Bataan.